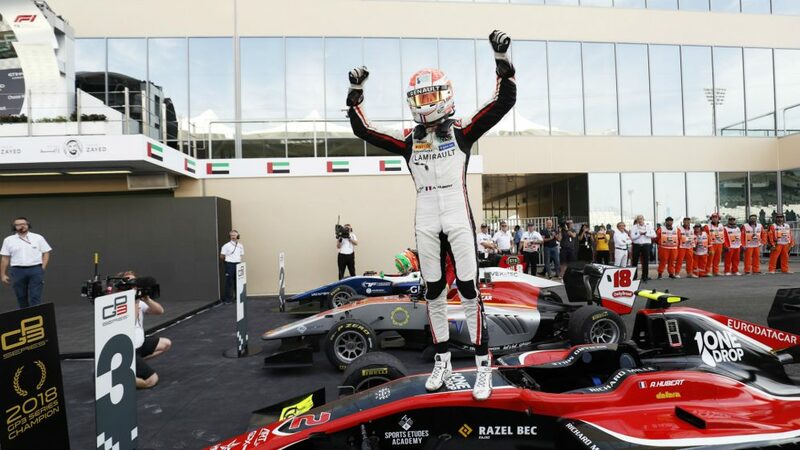 George Russell won’t forget 2018 in a hurry. Having already secured a 2019 F1 seat with Williams, where he’ll partner Robert Kubica in a new-look line-up, he ensured he’ll head there as F2 champion with a commanding victory in the Feature Race. Russell romped to pole position in qualifying on Saturday, a result that extended his standings lead over the Toro Rosso-bound Alexander Albon to 41 points with just 44 left to claim, meaning he only needed eighth in the opening race of the weekend to secure the title. He duly delivered, holding his nerve to claim the race win and, with it, seal a memorable title for ART Grand Prix in his rookie F2 season. 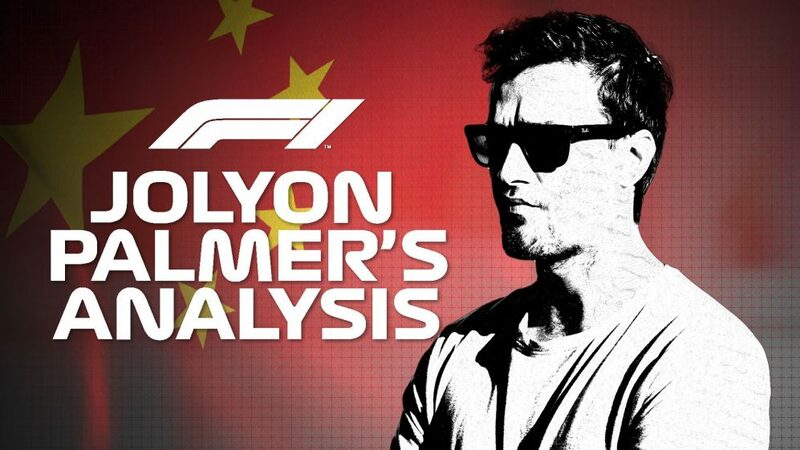 It wasn’t as a straightforward as he’d have liked, the Briton recovering from a slow getaway to ultimately beat Russian Time’s Artem Markelov and third-placed Luca Ghiotto. 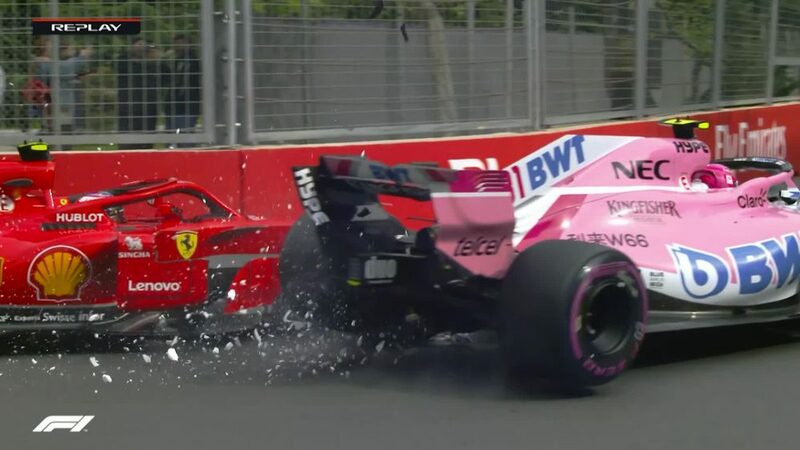 It was a tough race for Albon, who stalled at the start and could only recover to 14th, while his DAMS team mate Nicholas Latifi also failed to get away and was hit from behind by Arjun Maini – a scary moment but one from which both drivers fortunately escaped unharmed. Elsewhere, McLaren junior Lando Norris had to settle for fifth behind Nyck de Vries while Red Bull protege Dan Ticktum finished 11th on his F2 debut, missing out on a memorable points finish by one position - albeit 9.6s behind fellow Brit Jack Aitken. So who would win the final Formula 2 race of the season? 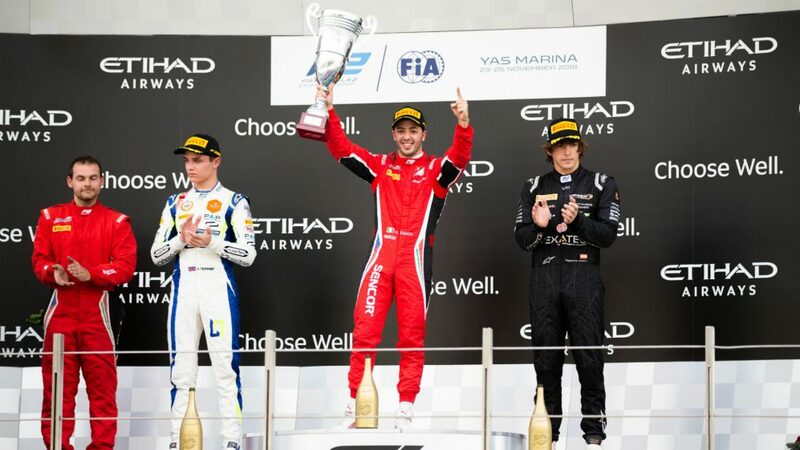 While Roberto Merhi started on reverse-grid pole, it was Ferrari junior Antonio Fuoco who claimed victory, stealing a march on his rival off the line and ultimately controlling the race. Even a Virtual Safety Car, introduced on the first lap when Sean Gelael tagged Niko Kari, didn’t test Fuoco too much, the Italian comfortably holding onto the lead on the restart and taking the chequered flag 1.7s ahead of his nearest rival. That nearest rival was Norris, who stole second from Merhi on the last lap to secure a much-needed P2, a result that ultimately helped him secure second in the F2 championship. The F1-bound driver bided his time, before benefitting from the Campos man locking up at Turn 8, with Merhi having to settle for third. 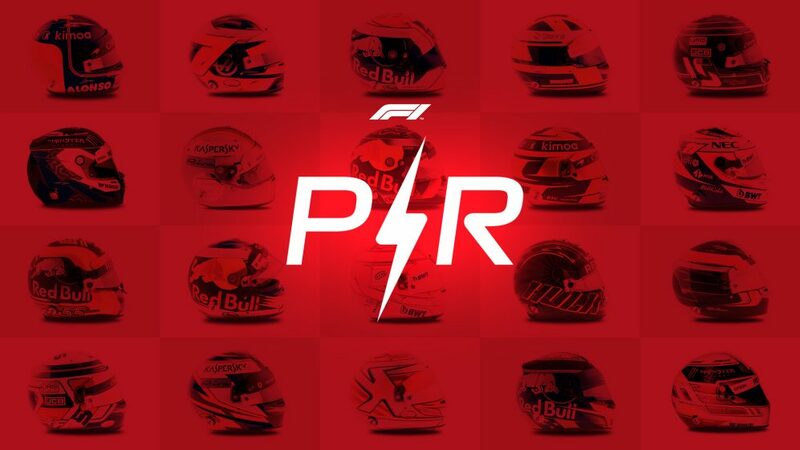 Having wrapped up the championship, Russell had a low-key F2 farewell, coming home fourth ahead of De Vries and Louis Deletraz, while Markelov beat Albon in the race for P7. That meant Albon’s eighth-placed finish in this race was his only point of the weekend, a frustrating end to what has been a superb season for him. 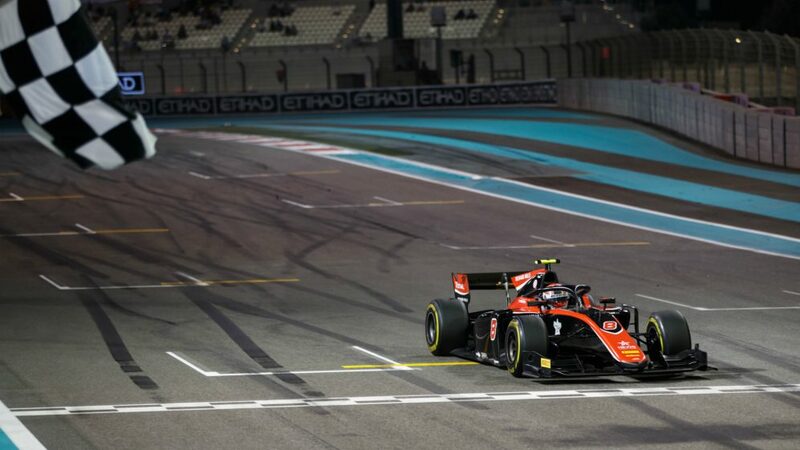 Like Russell, Hubert had an opportunity to wrap up the title in the opening showdown of the double-header at Yas Marina, and although he was unable to win his Abu Dhabi Feature Race, his third place was enough to ensure he became the last champion in GP3 history. Next year, GP3 will be replaced on the F1 support bill by the new Formula 3 championship with an all-new car, and Hubert’s controlled performance secured him a place in the record books, the Renault youngster coming home behind race winner Leonardo Pulcini and David Beckmann. Hubert’s ART Grand Prix team mate Nikita Mazepin, the Force India junior, was the only other driver in with a chance of claiming this year’s title. But despite starting on pole, he was handed a 10-second time penalty for not rejoining the track in the appropriate manner, effectively ending his championship hopes – and he came home fifth behind Callum Ilott. Behind them, a charging Giuliano Alesi mugged Jake Hughes on the penultimate lap for sixth while Juan Manuel Correa survived a late squabble with Simo Laaksonen and Tatiana Calderon for P8, securing reverse-grid pole for the Sprint Race. 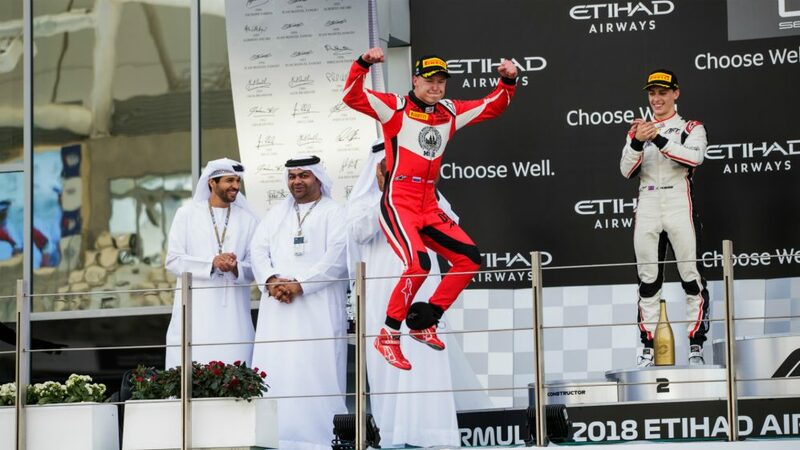 While it was Hubert who claimed GP3’s last-ever title, Mazepin could take some solace from the fact that he won the final race in the championship’s history, mounting a last-lap attack on Juan Manuel Correa to bow out in style. It was an impressive drive from Mazepin who, once Correa and Alesi were both handed five-second penalties for speeding under the Virtual Safety Car – the two drivers were ahead of the Russian – was able to pounce, taking the win ahead of team mate Hughes and Campos Racing's Laaksonen. It was action from the start, with Hubert, Beckmann and Pulcini all colliding on the first lap, with only Pulcini able to continue racing, while Pedro Piquet and Jannes Fittje had an unavoidable coming-together, forcing both drivers out of the race. Those two incidents brought out the VSC, one of which ultimately led to Correa’s penalty, and while he controlled the action for the majority of the race, he had to be content with sixth behind Ilott and Trident's Ryan Tveter. It’s hard not to award our final Driver of the Weekend accolade to the Briton, after he converted pole into victory in the opening race of the weekend and, in doing so, claimed the F2 title at the first time of asking. There was pressure on Russell. He went into the weekend with a massive 37-point lead over Albon, and had he allowed his rival to take pole and the Feature Race win, then the Sprint Race would’ve been a fun encounter to watch. But he didn’t let that happen, proving his ability by winning in style. Even after a poor start, which dropped him to second behind Prema's De Vries, Russell held his nerve to reclaim the lead and take a triumph that secured him champion status. “It feels good! There’s not much more I can say: after two years in GP3 it’s an achievement that was my target for this season, and I was one of the favourites but you have to work so hard for this, and I did. 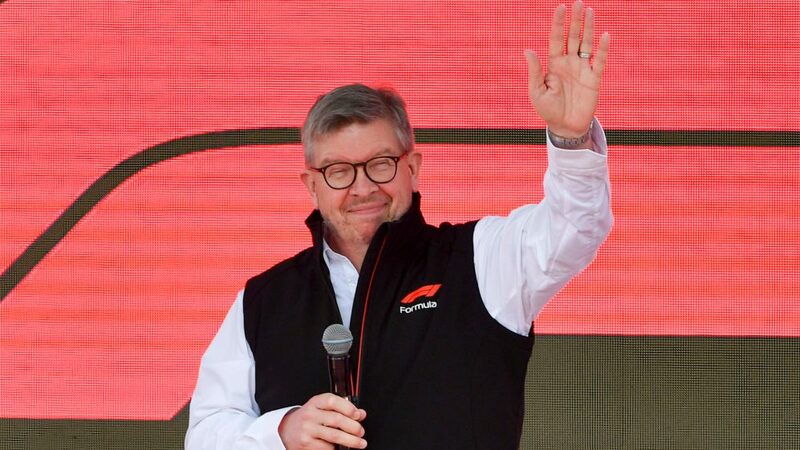 The last two months since Sochi have been quite long because I knew I was coming here with a good chance, but as long as it’s not sure… After the flag I even asked my engineer ‘do I still get it even if he doesn’t have a penalty and finishes second’! [laughs] If it’s not done I don’t feel that I am the champion, so today I am really happy: I’ve done some great results in the past, but since F4 I didn’t win a championship, so I’m just really, really happy about this title." 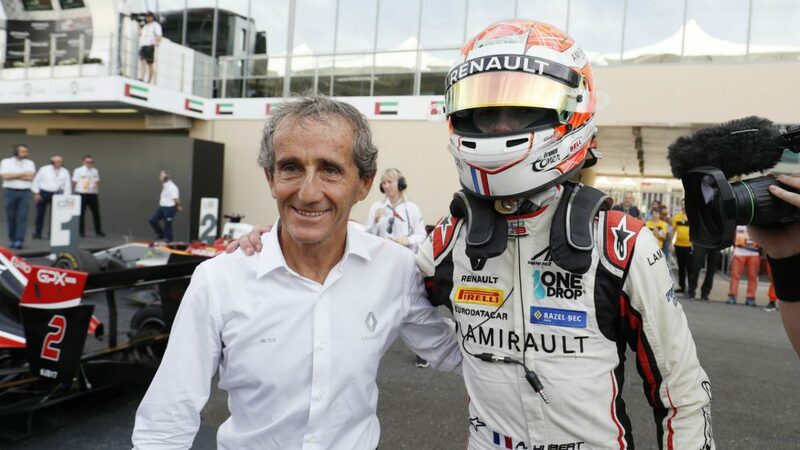 - Anthoine Hubert, pictured below with F1 icon Alain Prost. Russell, Norris and Albon securing a 1-2-3 means that for the first time since 2010, the top three drivers in F2 will all graduate straight to F1. Behind them, De Vries, who will drive in F2 next season with championship-winning ART Grand Prix, won the race for P4 ahead of Markelov. It was an all-ART top three in GP3, with Hubert leading the way ahead of Mazepin and Ilott. Pulcini, meanwhile, held on to fourth ahead of Beckmann, who enjoyed an impressive end to the season. 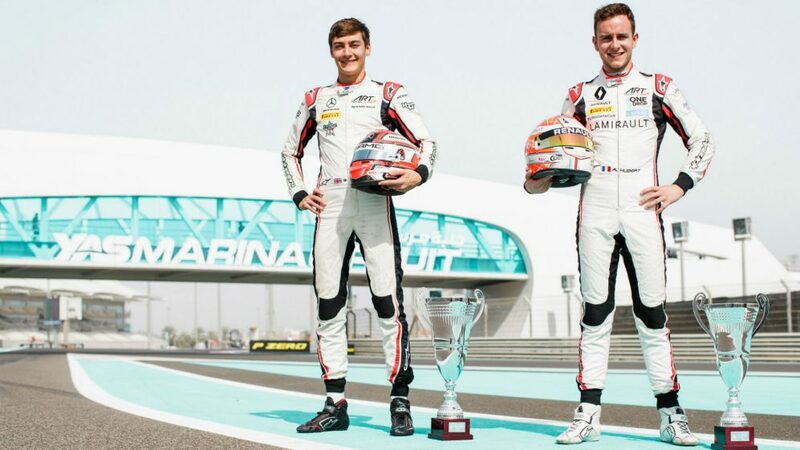 The teams remained in Abu Dhabi this week for the three-day, post-season F2 test, which begins on Thursday - and this will be the first opportunity for 2019 F2 drivers to work with their new teams, while others will be evaluated for a potential race seat next season. In regards to the 2019 F3 campaign and its new cars, a first machine will be handed over to the teams in mid-January, and the second and third car will be delivered together in February. There will be a shakedown with one car per team during that same month to allow them to become acclimatised to it ahead of the first official pre-season test.